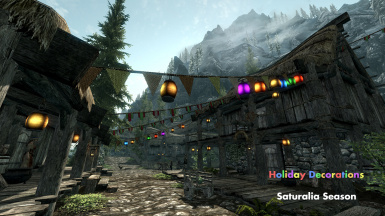 An addon for Wet and Cold, which goes beyond the scope of the original mod to spread holiday cheer throughout Skyrim. The wounded in the Temple of Kynareth should no longer join in on the festivities. NPCs should now wear festive hats throughout Saturalia day as intended instead of only past 5PM. Fixed a floating civil war decoration in Solitude. The Feast of the Dead now has a speaker (voiced by Zaf) who will recite the names of the Five Hundred Companions of Ysgramor. 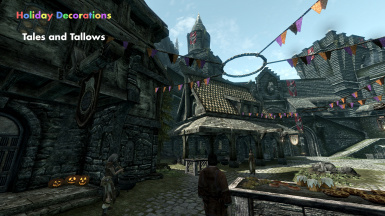 Temple celebrations in Markarth have been moved from the Temple of Talos to the Temple of Dibella. Birthdays should now work on any day of the year--even if they are on the same day as another holiday. Excluded many NPCs (primarily prisoners) from celebrations. Vanilla keyword "FloraFlower" can now be added to NPCs to exclude them from celebrations. Greatly reduced the chances of encountering the dead during Tales and Tallows. Made a few minor fixes to the fireworks. Disabled rotations on a few loadscreens. Compatibility patch for Open Cities is now available. 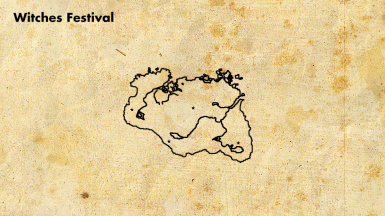 This patch must be placed under "Open Cities Skyrim.esp". All other Wet and Cold modules must be placed somewhere before "Open Cities Skyrim.esp". Festival of Lights decorations should now appear correctly. 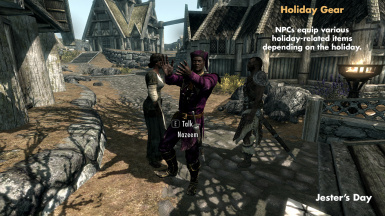 NPCs there now equip special lanterns as part of Holiday Gear. Fixed issue where indoor firework sounds would continue playing after the fireworks ended. Toned down fireworks to lessen performance impact. 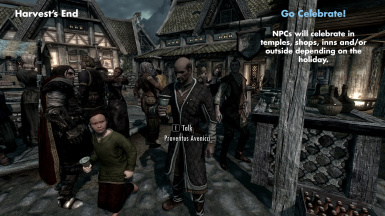 Added some dialogue to NPCs on Day of the Dragonborn that you will hear if you are the Dragonborn. Fixed issue where some holidays would not start/end on the correct date. Fixed issue where courier would greet you multiple times before a holiday. Fixed a minor decoration issue in Windhelm. Children no longer follow you inside on Day of the Dragonborn. Removed a few lanterns that would end up floating if the civil war was completed. Added a missing texture to the archive. Fixed an issue where the Tales and Tallows dead weren't walking at night. Fixed an issue where the Gildergreen would become disabled after changing settings. 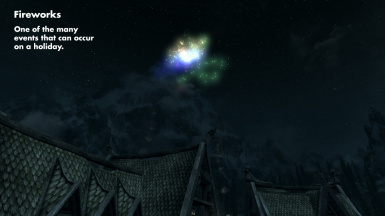 Fixed an issue where the Liberation/Reunification of Skyrim option remained disabled when the civil war had ended. For those who have already completed the civil war and saved with this mod installed, you must use console command "setpqv _wetquest cwstarted true". If you have not started the civil war then ignore this. This addon is no longer supported. See here for the updated, standalone version.